In a letter to thousands of employees, Charles Koch writes about the last election and his plans for the future. Dear Mr. Koch, Thank you, thank you, thank you – to your brother David and you – for being such fine and patriotic Americans. The courageous and principled stands that you take to help us retain and restore our liberty are truly inspiring. You are doing so much good for so many.—Larry Saunders Registered commodities rep. Franklin, Tenn.
Dear Mr. Koch, I want to thank you and your family for all you have done during this past election. The results are tough to acknowledge; however, the efforts that you put forth make me very proud of the company I work for. —Gretchen Chartier Koch Industries, Inc. Scottsdale, Ariz.
Past the exhalations of the Dear Leader, there’s a weird tension evident throughout the letter. Koch spends much of his piece complaining about the “crippling policies we have experienced in recent years,” comparing Obama’s government to the path of the former Soviet Union and Venezuela. Yet, other parts of the same newsletter boast that Koch Industries has never been better, with thousands of job openings, new acquisitions of smaller companies and plant openings. The economy has been so good, Koch Industries’ headquarters has been going through a major expansion. The economy has been so crippled under Obama that the Koch brothers have both more than doubled their fortune. 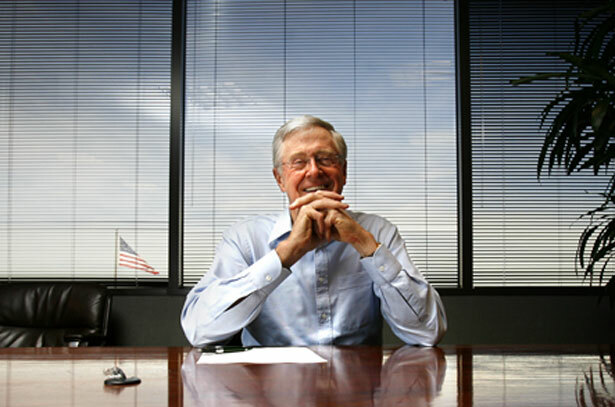 The Forbes list estimates Charles and David Koch were worth $14 billion each in 2009. The same list released this year now says they're each worth $34 billion. And as Charles notes in his letter, 85 percent of his employees and a majority of his company's assets are in the United States. How can Obama’s policies be so horrible if the economy is doing so well for Koch? A critic could point to certain wasteful programs or an outdated regulatory scheme, but how Koch has prospered so much under policies he says are destroying the economy, he doesn't say. It’s a one-dimensional letter, so these questions aren’t explored. This high minded rhetoric and claims of environmental stewardship are little more than public relations spin. Why the obsession with global warming? The “freedom” Koch discusses seems to relate to the freedom to pollute. Koch’s business empire, according to an estimate by Brad Johnson, emits several hundred million tons of carbon dioxide a year. The political suppression of climate science, and any reasonable response to the climate crisis, clearly benefits Koch Industries’ bottom line—and such selfish lobbying at the expense of the common good is the very worst example of crony capitalism. The company may soon gain an even larger audience. Earlier today, news reports revealed that Koch may purchase at least the newspaper division of the Tribune Co., which includes the Los Angeles Times. Read Lee Fang on a little-known US Chamber of Commerce plan to hack liberal advocacy groups.